COLUMBIA, S.C. (AP) South Carolina is changing its approach this season, turning to its deep group of guards to keep the four-time Southeastern Conference Tournament champions on top. 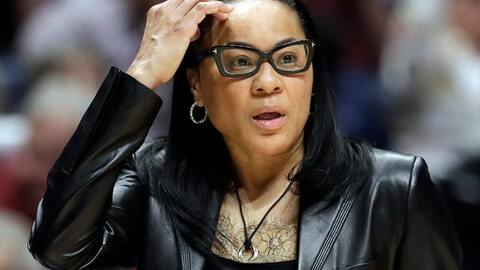 Coach Dawn Staley led the team to a national title in 2017, largely with a run of players like Alaina Coates and last year’s consensus national player of the year A’ja Wilson. But with the 6-foot-5 Wilson excelling as a WNBA rookie in Las Vegas, Staley’s most experienced and talented players start in the backcourt. There is no natural successor to Wilson, the dynamic All-American who set the school’s career scoring mark. So Staley is counting on experienced guard play from returning veterans like Tyasha Harris and Bianca Cuevas-Moore and first-year transfers like Te’a Cooper from Tennessee and Nelly Perry from Clemson. Opponents will likely see three guards in the lineup much of the time next season. Staley, a former point guard who led the United States to three Olympic gold medals, has toyed with four-guard lineups to take advantage of what she believes is the team’s improved quickness. ”She’s ready to take that next step,” Staley said. Perry may be the most surprising addition to the Gamecocks. She played three seasons with Staley’s former college teammate and good friend Audra Smith at Clemson, where Perry was the leading scorer two years ago. But she missed last season with a shoulder injury. When Smith was let go by the Tigers – Smith is now coach at South Carolina State – Perry joined the Gamecocks as a graduate transfer. Staley said Perry’s biggest role will be providing leadership lost with Wilson’s departure. ”When you lose someone like A’ja, you want in some other way to gain some experience in the locker room,” the coach said. Add senior Doniyah Cliney and sophomores Bianca Jackson and Lele Grissett to the guard mix while South Carolina’s top newcomers are guards in Victaria Saxton and McDonald’s All-American Destanni Henderson.